As you consider your college options, you might be thinking about how you can use your education and perhaps your interest in business to do good in the world. Many students with such a desire focus on working towards nonprofit, government, social service, or academic jobs. Meredith Ramirez Talusan found herself somewhere in between . . . in the Philippines . . . with her yarn collection. 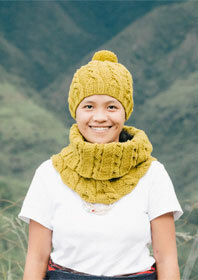 Talusan is the founder of Ricefield Collective, a social enterprise knitwear company employing women in the Philippines to create unique, handknit hats, scarves, and more. Here, she discusses what the initiative is all about and highlights social entrepreneurship as another viable option for making positive change. I grew up in a rural part of the Philippines where I attended Catholic school, then immigrated to Chino, California, at 15 with little knowledge of American culture, let alone the college admission process. Thankfully my wonderful guidance counselor Laurie Gates told me to pay attention to this random test I was supposed to take, the PSATs, and gave me a study guide for them. Scoring well led to a large stack of college brochures. I went to Harvard and ended up loving it intellectually even though the first couple of years were socially rough, keeping in mind I had only been in the country three years at that point. But I had some wonderful academic mentors as an English major and had the chance to be a research assistant for a professor, Elaine Scarry, which was definitely one of the highlights of my time there. And once I got my social footing, I ended up with many wonderful and brilliant friends. I also got the chance to explore artistic interests that have become mainstays of my life—dance, theater, and photography. I went on to get an M.F.A. in visual art from California College of the Arts, and I am right now on leave from my Ph.D. program in comparative literature at Cornell while developing Ricefield Collective. What is the Ricefield Collective, and what are your goals? Ricefield Collective is a social enterprise that trains indigenous women in the Philippines to produce high-quality knitted accessories that allow them to stay with their families on their ancestral land. We provide dignified, fulfilling work that keeps families together and allows people to remain in their ancestral communities rather than be forced to move to crowded cities or to be separated from their families to work abroad. How did your business start and flow out of your academic experience? I was doing research on indigenous poetry in the northern region of the Philippines when I became aware of how few jobs there were. The women of the region were (and are) leaving land that their ancestors have lived on for hundreds of years to move to cities where they had no permanent homes or community. I knew I had to do something. The project began organically, with me teaching a group of women how to knit, and grew to be a full-fledged enterprise when I got friends involved to see how we could sell their products over the Internet. We launched a Kickstarter that raised over $70,000 from more than 1,000 backers, and I’ve had the opportunity to talk about our business in forums such as the recent TEDx event at Cornell. Recently, we started working on a campaign with partner social enterprises Ashoka U and Photowings to encourage college students to think about social enterprise as a possible career. It’s called “Keep Your Hat On,” and we’ve designed limited edition hats specifically for it. You can follow us on Facebook and Twitter for updates. What are social enterprises and B corporations? Social enterprises are entities that use business methods for the sake of a social good. The B in B corporations stand for benefit, and that’s a relatively new legal designation in many states that allows corporations to function not primarily for economic gain, but to provide some sort of social benefit. Unlike traditional corporations, which are legally beholden to maximize stockholder returns, B corps are charged with balancing social, environmental, and shorter term financial goals. If I had known that you could do business with these more holistic sensitivities, I would have pursued a career in social enterprise much sooner! What do you see as the most important components of your business? Our team leverages our unique talents to make the highest quality knitwear, present it in the best possible way on the Internet (with the help of our fabulous social enterprise and technology consulting team at Colab.coop), and direct as much of its revenue as possible to our workers. We’ve set up a rigorous design and training process to do that, and our background in the arts allows us to present our products in attractive ways over the Internet. Finally, our ability to seamlessly move between cultures and to engage our workers as full collaborators speeds up and improves our processes quite a bit. On a more concrete level, and with an eye towards encouraging budding social entrepreneurs, it’s useful in college to learn to think clearly about data, tell a powerful story, communicate well, and build relationships. What advice do you have for students entering college who want to work in social enterprise? Pursue your passions with an eye for what you can do to change the world. You don’t need to major in business or economics, though it’s always useful to develop some knowledge in those areas, but many entrepreneurs in our sector create change by pursuing their interests and turning them into business ideas. My background is in literature and the arts, and our CTO Brian studied philosophy. We both leverage the ideas and skills we learned in our majors every day for critical thinking, analysis, and better ways to communicate our products. There are many skills in many areas that are needed to create change, and the great thing about becoming an entrepreneur is that you can create a business out of your own unique skill set.